A couple years ago, my water bill started to increase a little bit each bill cycle. Last summer, my son noticed a leak in the basement. When a family friend came over to inspect, he said it was because of the toilet. He fixed the leak, and consequently the water bill, but said eventually the floorboards were going to need replacing under the toilet. In the last year, my son and I have had a host of congestion/respiratory issues. 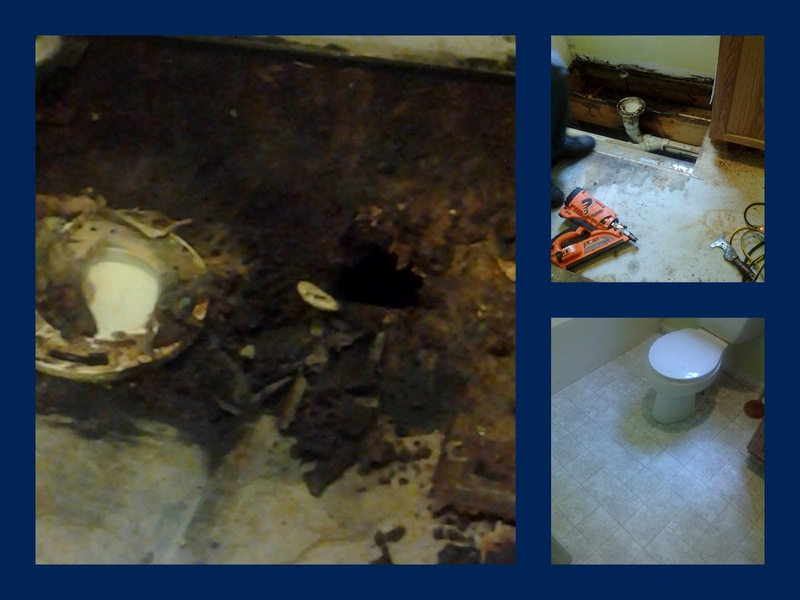 In hindsight, the mold forming underneath the toilet was probably a major culprit. At the same time, the toilet has been sinking lower and lower into the floor. Enough to be concerned – but not enough to feel like an emergency. When the repairman removed the toilet (shown below), he found that I had a ton of mold that had accumulated underneath the linoleum and eaten through the floorboards. He said “it’s the worst I’ve ever seen.” The mold had to be treated/removed, wood replaced, and the entire floor redone. It was hard to imagine how extensive the damage was from the outside. From the outside, the repairs needed seemed minor. Time had avenged me for my complacency. This struck a cord. Around Memorial Day, I became ill with a bad head cold. By the time I started to feel better, I began experiencing symptoms of the stomach flu. After almost three weeks of this “stomach bug” I finally took myself to urgent care where I found out that I had an infection as well as symptoms of a more serious condition. I was told to rest, cut the stress, go to my primary care physician, and change my diet. I felt jipped. I wanted the doctor to say it was gonna be better in 7 days and a prescription. Over the last few weeks I have been examined in the most intrusive ways imaginable and several things have been uncovered. Basically, there is no quick fix. The only way to help my digestive issues is through diet, stress management, and sleep hygiene. Soooo…that’s what I’m doing. Starting “from scratch” now that I have cleaned out my insides, paying attention to how my body reacts to what I eat, slowing down to get the rest my body has been craving. I am moving slow, but I am not complacent. Each day I am working towards my goals. Since I started this personal challenge, I have had to keep reminding myself that this is about health – not weight. This was a reminder that, as long as I am not complacent, it is okay for me to go at my own pace. I am not in competition with anyone but myself. Yesterday, on Day 66 of this personal 90 day challenge, I weighed in 20 pounds lighter than I was on Day 1.